Filters are used to control whether a target is displayed as an ordinary target or as a tiny almost-invisible target. In busy areas this allows you to reduce clutter on the screen and help you to focus on the targets that are most important. There are four filters and a target is shown as an ordinary target only if it passes each filter. At that point the target is known as "filtered" meaning it will show up in the count of filtered targets and will appear on the screen as an ordinary target. Speed adjusts the minimum speed a target must be moving to be shown. Range adjusts the maximum range of a target to be shown. CPA adjusts the maximum CPA (closest point of approach) for a target to be shown. 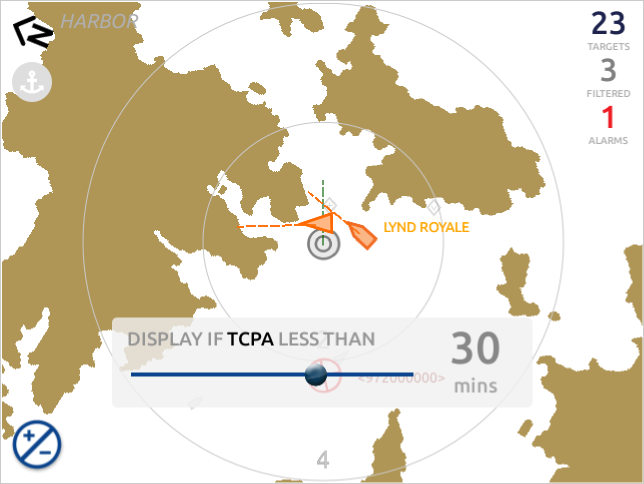 This allows you to view only those targets that will come close to your vessel at some point in the future. TCPA adjusts the maximum TCPA (time of CPA) for a target to be shown. This allows you to view only those targets that will come close in a short amount of time. Remember that the four types work together. A target must pass all four filters to become "filtered" and consequently displayed as an ordinary target. You can switch all the filters on or off at any time by using the Filter Settings dialog. This dialog can be accessed from the Plotter Menu. 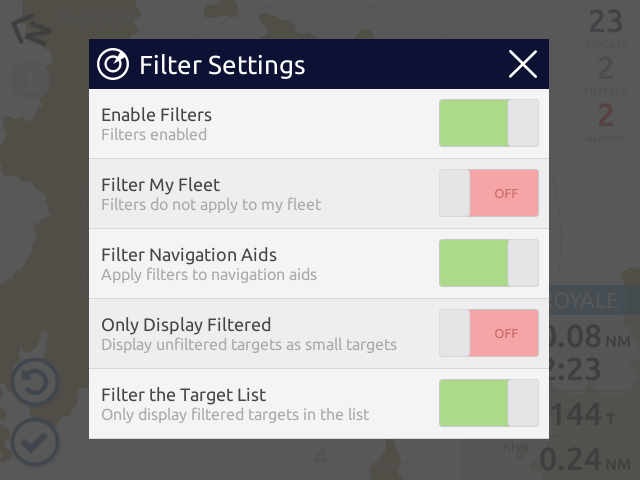 Even when filters are switched off, you can still adjust their settings and then make them active later by switching them on in the Filter Settings dialog. but it may still be selected by touching it. the options in the Filter Settings.